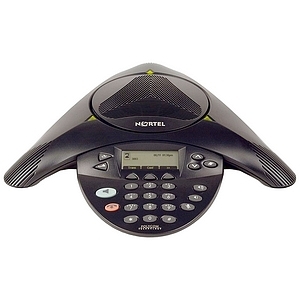 The Nortel IP Conference Phone 2033 is ideal for managers, executives, and officeadministrators. The 2033 IP Audio Conference Unit is a full duplex, handsfree conference phone which is ideally suited for conference rooms of small-to-medium size and managerial/executive offices. The 2033 IP Conference Phone is directly connected to the LAN via a 10/100 BaseT Ethernet connection, offering simplified management and reducing the time and cost associated with moves, adds and changes. Full duplex speakerphone with acoustic clarity technology supports simultaneous natural conversation in conference settings. Backlit 3x24 Liquid Crystal Display enhances viewing angles for conference participants. Power Options - 802.3af Power over Ethernet module or local AC power. Extend up to 6' on either side of base unit for increased microphone coverage on longer conference tables. Compatible with the Nortel IP Audio Conference Phone 2033. Nortel 2003 IP Conferencing Phone Universal POE Power Supply.